More than six years of observations by NASA's Fermi Gamma-ray Space Telescope show the entire sky at energies billions to trillions of times greater than visible light. Astronomers have performed the best-ever census of the high-energy sky. Scientists used more than six years' worth of data collected by NASA's Fermi Gamma-ray Space Telescope to construct an incredibly detailed map of gamma-ray light, which can be more than a trillion times more energetic than visible light. 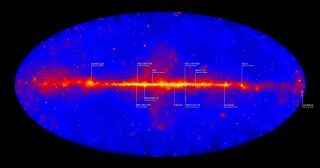 They also created a video to highlight the gamma-ray universe view. "An exciting aspect of this catalog is that we find many new sources that emit gamma rays over a comparatively large patch of the sky," Jamie Cohen, a University of Maryland graduate student working with the Fermi team at NASA's Goddard Space Flight Center in Greenbelt, Maryland, said in a statement. "Finding more of these objects enables us to probe their structures as well as better understand mechanisms that accelerate the subatomic particles that ultimately produce gamma ray emission." The study team carefully reanalyzed all the gamma-rays spotted by Fermi's Large Area Telescope (LAT) since the spacecraft's 2008 launch, getting a better understanding of the instrument's response to each detection. This work boosted the LAT's sensitivity, and allowed researchers to spot many gamma-rays that had slipped through the cracks. "Because of the improved sensitivity, the LAT has detected over 360 sources, which is an extremely large number of sources for this extreme energy range," Marco Ajello, a Fermi team member at Clemson University in South Carolina, said Thursday (Jan. 7) at the 227th meeting of the American Astronomical Societyin Kissimmee, Florida, where he presented the team's results. With the new data in hand, Ajello and his colleagues created a map of the sky at energies ranging from 50 billion to 2 trillion electron volts. For comparison, the energy of visible light ranges from about 2 to 3 electron volts, NASA officials said. "This is an extreme energy range, which is typically only available to telescopes on the ground and is now available to the Fermi Large Area Telescope from space," Ajello said. Because gamma-rays are produced when lower-energy light collides with accelerated particles, they hint at the most extreme physical environments throughout the universe. Of those 360 sources found by Fermi's LAT, for example, 75 percent are likely "blazars" — faraway galaxies that sport jet-spewing supermassive black holes at their cores. Another 11 percent likely reside within the Milky Way; these could be supernova remnants or winds streaming from rotating neutron stars that accelerate particles to nearly the speed of light, Ajello said. The remaining 14 percent are unknown. "So this means there is still some space for the discovery of new populations," Ajello said.